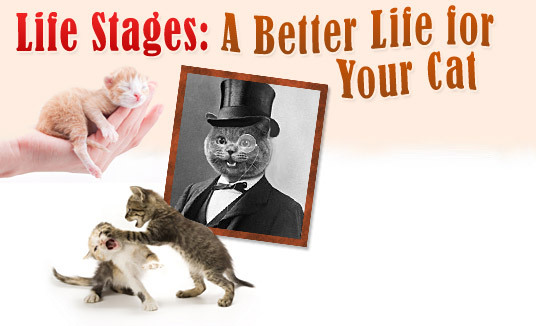 As your cat ages, it will progress through various life stages. As a pet owner, you will need to become familiar with these so you can be prepared when your cat enters each of them. Educating yourself about these stages will help you to take any corrective action as needed to help your cat. (New born to 5 months) They are born with their eyes and ears closed for about 2 weeks and are dependent upon their mothers. At this stage, they eat, sleep and meow when they are hungry. Once they are about 4 weeks old, they will begin to explore and get into mischief. Also this is when they will learn to how to use the litter box. (6 months to 2 years) This stage in life is when you should neuter your cat. Cats tend to fight with other cats over food and territory. Make sure you get your cat vaccinated, especially outdoor cats because they could get diseases and spread them to your other cats. (3 to 7 years) At this stage cats are less active. They are more susceptible to disease like diabetes, kidney disease and cancer, so it would be good to always take your cat for their regular checkups. (7 to 11 years) Senior cats will sleep more probably up to 18 hours a day. They are prone to arthritis and dementia. Older cats need more warmth also. Be sure to provide your older cat with a warm place to snuggle. In addition, the metabolism of an older cat will change, so they may need a special diet.